The Grande Arche de la Défense is situated in western Paris and is a monumental arch and building in the business district of Paris known as La Défense. Built towards the end of the 20th century, the arch is a modern and prominent feature in Paris. The arch also marks the end of the Voie de Triumphe, a large road that connects the east and west of the city. The other end of the road is marked by the glass pyramid that is found at the Louvre. The Grande Arche de la Défense is easily accessible by taking the metro as far west as one can and exiting at La Défense. The 200th anniversary of the French Revolution in 1989 was marked by the commissioning of the “Grands Projets.” The aim of the projects was to promote culture and revitalize the city. The work was commissioned under the then president François Mitterrand. The Grands Projets included not just the Grande Arche de la Défense but the pyramid found at the Louvre, the national library and the Bastille Opera. La Défense housed the business district for Paris, but the futuristic area was void of attractions and needed an iconic centerpiece that visitors would flock to see. A competition was launched in 1982 by President Mitterand to create the much needed attraction. There were 424 entries and the winner, in 1983, was a Danish man named Johann Otto Von Spreckelsen. Sprecklesen’s winning idea for the landmark was a huge and modernistic arch that resembled a hollow cube of gigantic proportions. It took five years to complete the arch, with construction beginning in 1984 and being completed in 1989. With 1989 being the year of the bicentennial celebration for the French Revolution, timing for the finished arch was perfect. This and the other grand projects were finished for the celebrations. 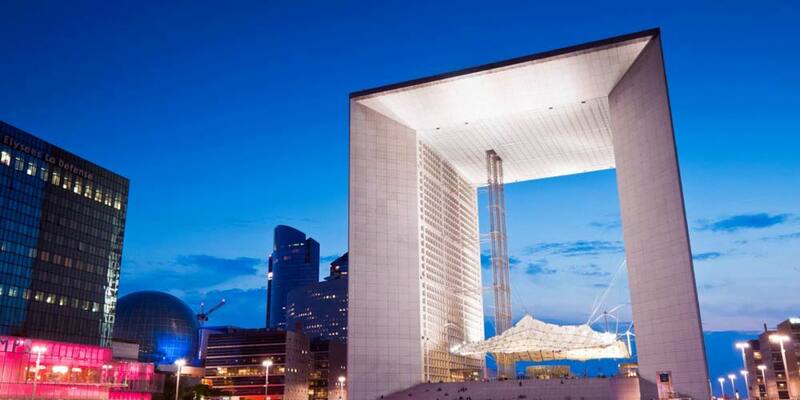 The modern arch is perfect for the business district of Paris as it contains thirty five floor levels of office space. The arch is huge and is easily twice as large as the Arc de Triomphe. The archway is large enough to fit Notre Dame underneath it. The arch is 110 meters high and a massive 106 meters wide. The sides where the office spaces are contained are a generous 19 meters wide. The structure weighs a massive 300,000 tons. The “cloud” is a structure made of white plastic panels that resembles a tent and helps with wind resistance on the structure. Before 2010 you could take an elevator to the rooftop of four courtyards. The courtyard spaces are decorated by works of the artist Raynaud. From here visitors could take stairs up to the observation platform. However, sadly these areas are now permanently closed to the public following a problem with the elevator. The arch is still an enormous attraction for the city and brings vibrancy and life to the financial zone, attracting hundreds of visitors every day.